A brochure that contains a summary of Westinghouse' Electric's gas turbine experience, starting during the 1940s when Westinghouse developed the first American-designed jet engine under contract with the U.S. Navy. Westinghouse Electric Corporation was a pioneer in the development of combined cycle power technology. The combined cycle concept marries gas turbine and steam turbine power generation by utilizing the "waste" heat energy in the exhaust of the gas turbine to generate steam to drive the steam turbine generator. Earliest combined cycle plants, installed during the early 1960s, were usually one-of-of-a-kind customized designs. In 1971, Westinghouse introduced the PACE (Power At Combined Efficiencies) pre-engineered combined cycle plant based on using two 80 MW W501B gas turbines and one 100 MW steam turbine. 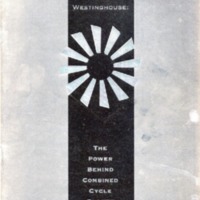 This brochure was produced in 1991 by the Power Generation Business Unit, headquartered at The Quadrangle, Orlando, FL, to describe the then-current combined cycle products offered by Westinghouse. Standardized plants ranged in size from the 68 MW plant based on one W251B11/12 gas turbine to the nominal 500MW 2-on-1 plant using two W501F gas turbines. Original 11-page brochure, 1991: Private Collection of Harry L. Jaeger. Digital reproduction of original 11-page brochure, 1991. “Westinghouse: The Power Behind Combined Cycle Plants.” RICHES of Central Florida accessed April 25, 2019, https://richesmi.cah.ucf.edu/omeka/items/show/7425.